Panoramic Universal Ltd. is back again with its unique concept of organizing food festival across its hotels and resorts. This time it's in Mysore, after the Dosa fest, we are organizing a kebab festival: Angaar at Hotel United-21, Mysore. The festival would be celebrated for 10 days from 10th of Feb to 19th of Feb 2012, where you could munch in to unlimited Veg and Non-Veg kebabs. With garlic naan and dal makhni, you can spice up your taste which would make your taste buds go for more and more. The price at which you could enjoy all the Veg and Non-Veg is just Rs 399/-. With various options to choose from like Chicken ajwani tikka, Hara bhara kebab, Gulafi kebab and Hariyali dingri tikka, you couldn't resist yourself from enjoying all these at Hotel United-21, Mysore. 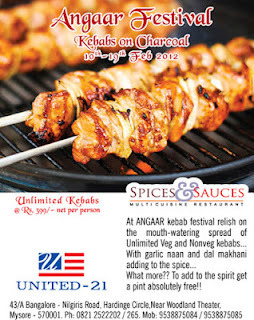 Catch up with your near and dear ones, and make sure to hop in at Hotel United-21 Mysore between 10th Feb to 19th Feb 2012 to enjoy unlimited Veg and NonVeg kebabs.